These sticky notes and tabs are made of high quality materials,can be stick and re-stick,easy to use and peel off,won\'t residue,can keep clean and tidy.It\'s small size which are convenient for carrying out,you can put it in your handbag or backpack. Sticky Notes:Sticky notes are perfect for you to write down quick message,the candy color are very eye-catching for people.You can use them at home,school,office or any other places.Convenient to write all kinds of messages,bookmarks,memo pads and more. Pop-up Index Tabs:These sticky tabs are made of high quality PET with special design for you that you can pull-out the tabs one by one.These page flags are convenient for you to marking the important information in magazine,notebook,documents or other files and make them more eye-catching. Sticky Tabs with Ruler:These sticky tabs are translucent neon colors,won\'t cover the important information and can make the information more attractive,the flexible soft ruler is convenient for you to use in work or daily life. 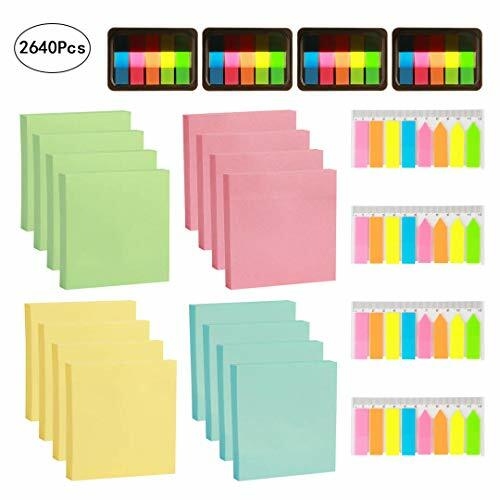 Large Quantity:Package including 16 pack sticky notes with 4 different colors(100 sheets per pack),4sets neon pop-up index tabs(each set has 100pcs),4sets translucent page markers with ruler(each one including 160 pcs),totally 2640 pieces. Talk about a FULL box!